Transferring property to your children to avoid probate can cause big problems if a child files bankruptcy or is otherwise unable to pay his debts. There I was at the Ripley’s “Believe it or Not” museum in Myrtle Beach, South Carolina, when I came across a display of humorous tombstones. 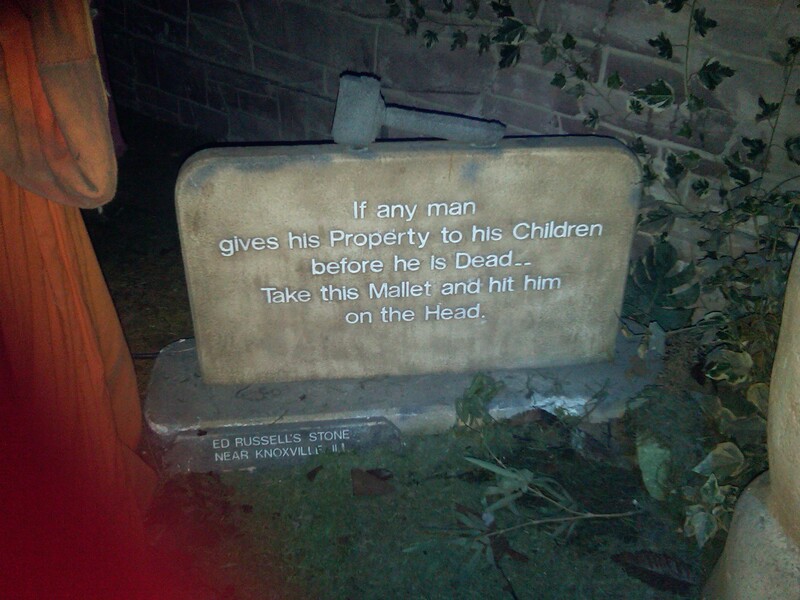 The one pictured above says, “If any man gives his property to his children before he is dead, take this mallet and hit him on the head.” I chuckled and thought back to the many problems created when parents transfer property to their children. I see it all the time. The parent’s reasoning is that since Junior is going to end up with the house anyway, let’s make it easy on Junior and put his name on the home right now as a joint owner. That way, when the parent dies, the house will be owned by Junior by operation of law, without the need for lengthy and expensive probate proceedings. This type of probate avoidance maneuver can cause a variety of problems for the parent. First, unless done gradually over a period of years, the parent may incur estate tax liability. Second, if the parent needs to apply for Medicaid to pay for nursing home care, the transfer may disqualify the parent from receiving benefits. Third, the transfer may expose the parent to claims of the child’s creditors or bankruptcy trustee if the child experiences financial difficulty or files bankruptcy. Since this site is all about bankruptcy, let’s examine what could happen if the child gets into financial trouble and files bankruptcy. Because the child has a legal interest in the home, that interest will have to be disclosed in the bankruptcy paperwork. The debtor child typically says something to his attorney like, “my name is on my mom’s home, but she just put my name on there in case something happens to her.” I call this “bare legal title.” The debtor child has no true interest in the property; mom’s the real owner. Mom paid the down payment, pays the monthly mortgage payments, taxes, maintenance, and all other costs associated with the home. Mom put Junior’s name on the deed simply so that when she passes away, Junior will become the owner of the property without the need for probate. All these issues can be avoided by doing estate planning the right way. Getting estate planning help from an attorney doesn’t cost very much, and it avoids serious problems down the road. In addition, probate isn’t nearly as time-consuming and expensive as it once was. So I have to agree with the tombstone. If any parent gives his property to his child before he is dead, he should brace himself for a mallet blow to his head. Believe It…or Not!